Disclosure: Recipe for lidl Belgium. All opinions shared are my own. Hamra street is known to be the hipster street from Beirut featuring clothing shops, modern bars and restaurants. Being inspired by the Label5 cocktail I shared last week (recipe here) I rubbed the beef burgers with the leftovers of the Lebanese Rub used to spice the cocktail. Sounds curious isn’t it? Go on and take a look for the cocktail! It’s awesome. To stay in the Lebanese food section I made a Pumpkin Humus Spread for the Hamra Harvest Burger. 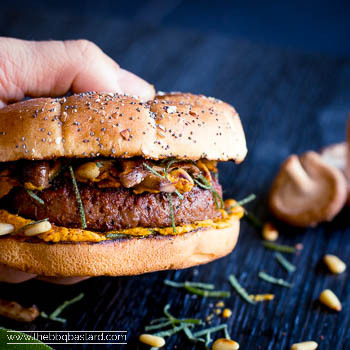 This Humus replace the sauces normally used for a burger making it a somewhat more healthy burger. But most important it’s bloody delicious. Beside the Pumpkin Humus I added some more delightful toppings. I baked some leftover shiitake mushrooms in fish sauce and lemon for a touch of asia. Have you tried mushrooms and fish sauce? Seriously try! It’s damned easy and my favorite mushroom recipe. Add some roasted pine nuts for extra flavor and freshly cut sage and Sumak for a fresh hint! Sumak is a middle eastern spice with a deep red colour! It’s adding a nice colour and subtle citrus taste to your burger! At least if you sprinkle it on top of the burger just before serving. When turning hot Sumak loses it’s flavor very fast. So I’m curious what you think of these Burgers! I would love to see your feedback on the social media channels! If you have a burger you want to share, please do! It’s always awesome when inspiration is shared. So if you want to share this recipe with your BBQ friends? Don’t hesitate to use the social share buttons, cause sharing is caring 🙂 Have fun preparing the Hamra Harvest Burger! Time for a city trip to the hip streets of Beirut! Let's take a stop in Hamra street to taste this modern Lebanese style Hamra Harvest Burger, combining autumn harvested pumpkin with the southern influences of Beirut. This burger will bring the indian summer to your tastebuds. It might sound hard to make, but it's not! Just give it a try. Mix all ingredients for the libanese rub by hand. 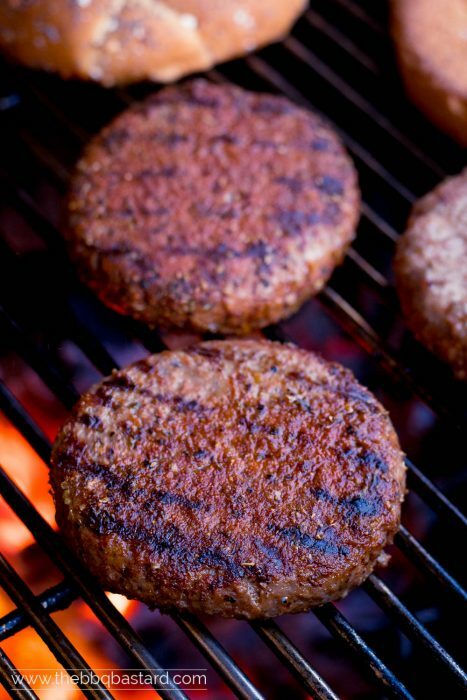 Sprinkle the rub on the burgers and rub them on both sides (about 1 tsp./side). Put the burgers back in the fridge. Cut the pumpkin in cubes or slices from +- 1cm thick. Pour some oil flavored with ginger powder and freshly cut sage over the pumpkin slices and sprinkle with salt. Roast the pumpkin until done. Watch out it doesn't burn or you'll have a bitter taste in your spread. Add the walnuts, lemon juice, 1tsp oil, chili pepper, salt and pepper at taste. Mix the pumpkin mixture to a Humus like texture. Taste and add some more ingredients at taste. When the mixture is to dry you can add some olive oil to make it smooth like silk. Add some oil to a skillet and rub it over the bottom with a piece of garlic. Put the skillet on top of your fire and wait until the oil gets hot. Meanwhile you start slicing the shiitake. 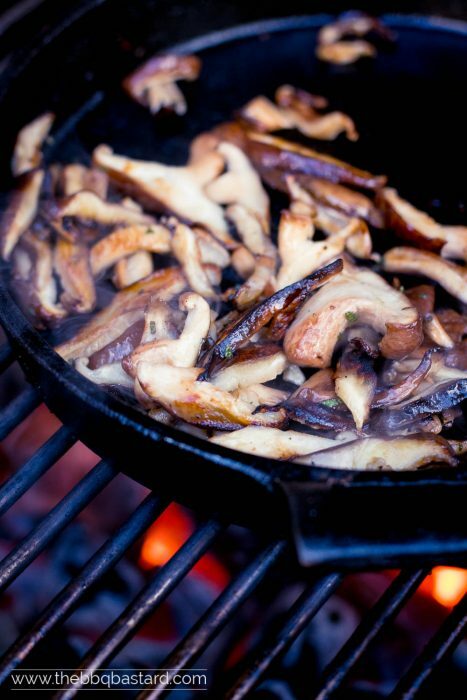 Add the shiitake to the skillet and sprinkle with fish sauce and lemon juice while baking them golden brown. Remove the shiitake slices and bake the pine nuts golden brown in the same skillet. Grill your Lebanese flavored burgers on the bbq until they reach an internal temperature from between 55°C to 58°C (130°F to 136°F). 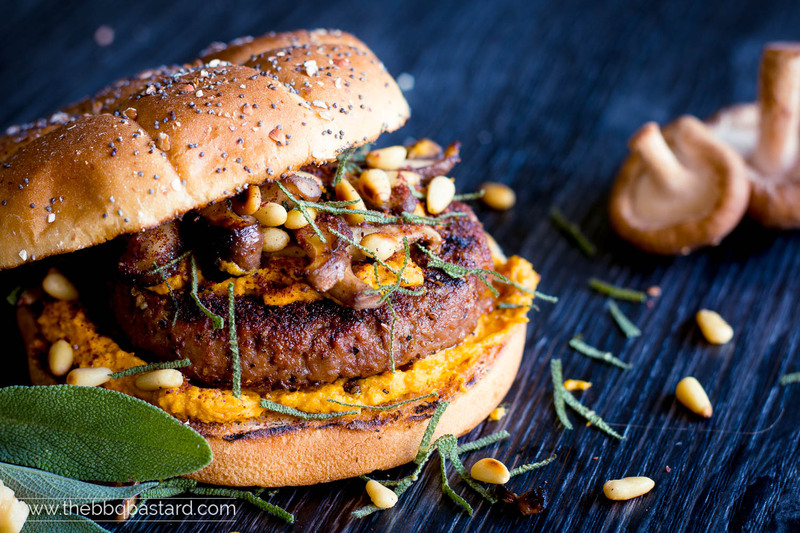 Spread some pumpkin Humus on the bottom bun part and put the Lebanese rubbed Burger on top of it. 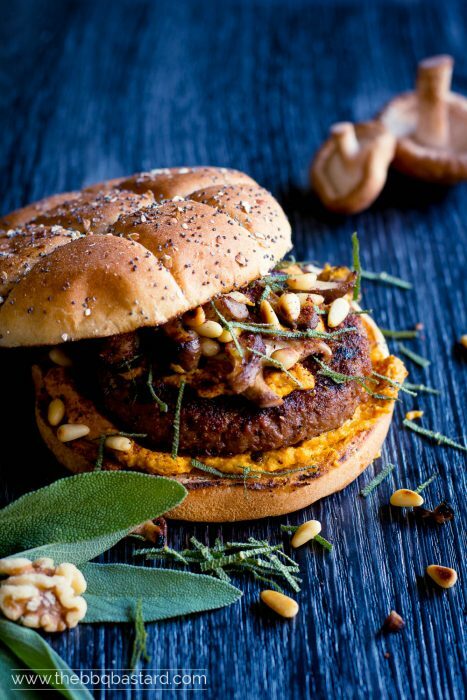 Add another tablespoon of pumpkin humus on top of the burger and finish with baked shiitake, pine nuts and freshly sliced sage at taste. To finish it completely you might add some sumak for the lovely colour and fresh citurs taste.